Dear Sweet Friend, I’ve actually been looking forward to the change in seasons this fall, because I absolutely LOVE sweatshirt weather. Hands down, fall is my favorite time of year. It’s full of football games, going back to school, new clothes, a refreshed spirit, a still-tanned face, pulling out the fall brown shoes, boots, leggings and cardigans, and getting as reprieve from the hot weather. It’s also the time of year I start bringing in my front porch cushions, the hoses, trimming down my lilies, and generally preparing for cooler nights. Even though all my flowers have stopped blooming, it doesn’t mean I’m ready to stop enjoying the outdoors yet! There will be plenty of time for that once the snow comes. I’m sitting on my front porch as I write this, dreaming about what I’ll do this year to bring some of the outdoors into my home as the seasons start changing. I want to share some of the best ideas I came up with, so you can try this too! 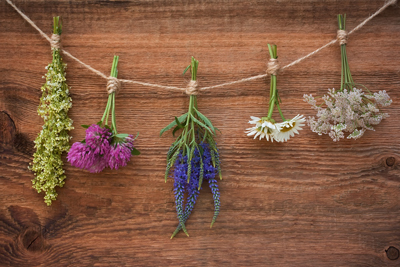 1 - DRIED FLOWERS - Cut some of your flowers (hydrangeas or other hardy flowers work great for this!) and arrange them into a nice grouping, bring them inside, put a ribbon around the base, and hang the bouquet upside down from a curtain rod in your kitchen. After a week or so, then will dry up and then you can use them all season long as aromatic potpourri. 2 - MAKE A MOSSY SUCCULENT GARDEN - Dig up some moss from around the trees or in the woods in your yard (or ask a friend who has some trees on her property! ), let it dry out for a week, and then set aside. Go to your local hardware store (I like Lowe’s), pick up 3 very small succulent plants, a shallow container, and some potting soil. Arrange your plants, add the soil, and then cover the bare spots with the moss. Now you’ll have a perfect display piece for your dinner table or coffee table, and you’ve brought a touch of the outdoors in! I especially love succulents because I hardly ever have to water them, and they don’t need much pampering. 3 - MAKE A CORNER FOCAL POINT - I like to scour the woods on my property for fallen branches of all different sizes & thicknesses to use as a focal point for the empty corners in my living & dining rooms. You can use an old milk can or a tall vase -- 32” min. 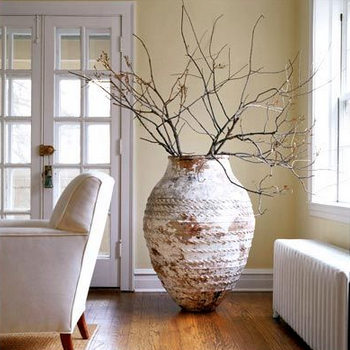 -- paint it a cute color, and add your branches for a quick, easy, and inexpensive way to fill an empty corner in your home. 4 - PAINT A CANVAS - One quick way to create custom artwork in the perfect color is to paint it yourself! It doesn’t take much skill or time, you can match the color perfectly to the fabrics in your room, and you can customize it for the seasons. For fall, I would get a large canvas or 2 smaller ones, pick up some acrylic or watercolor paints, and just draw simple lines or circles in fall tones. Add lots of water to your paint for an abstract look. I like oranges, mustard yellows, browns and dark reds for fall. 5 - NATURAL MOTIFS - Bring in some natural patterns! One quick way to change up the look of a living room or den is to swap out the pillows seasonally. For fall, I like pillows with branches & leaves and other natural looking patterns. You can do this with a gallery wall as well. Try swapping out a couple of the photos with some pressed leaves. 6 - ROUND IT UP - I like to use trays and bowls for styling the objects in my home and grouping items together. It’s a trick I’ve used for years because I don’t like clutter, and it makes it easy to dust, makes items looked intentional, and you can swap out the items seasonally. Moss covered balls from the hobby store are a good bet for fall. Couple them with some oversized pinecones and branches in a vase, and you’ll be all set! I hope a few of these ideas inspire you, my dear sweet friend! Let me know which ones you end up trying and how they turned out. I’d love to see a picture of it!